Watercolour with pen and ink of a busy riverside scene with a civil servant being carried ashore in Calcutta by William Prinsep (1794-1874) dated 1822. 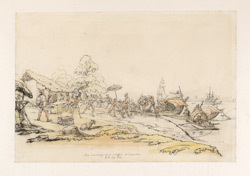 Inscribed: 'The landing of a griffin at Calcutta. WP. Sep. 1822'. 'Griffin' was the term used for a new employee or 'writer' of the East India Company recently arrived in India. In this drawing the new arrival's boxes are being piled up on the bank and a palanquin awaits to transport him to his destination. In 1828, Sir Charles D'Oyly published his burlesque poem 'Tom Raw the Griffin...Descriptive of the Adventures of a Cadet in the East India Company's Service...'. D'Oyly was a respected amateur artist and East India Company employee.